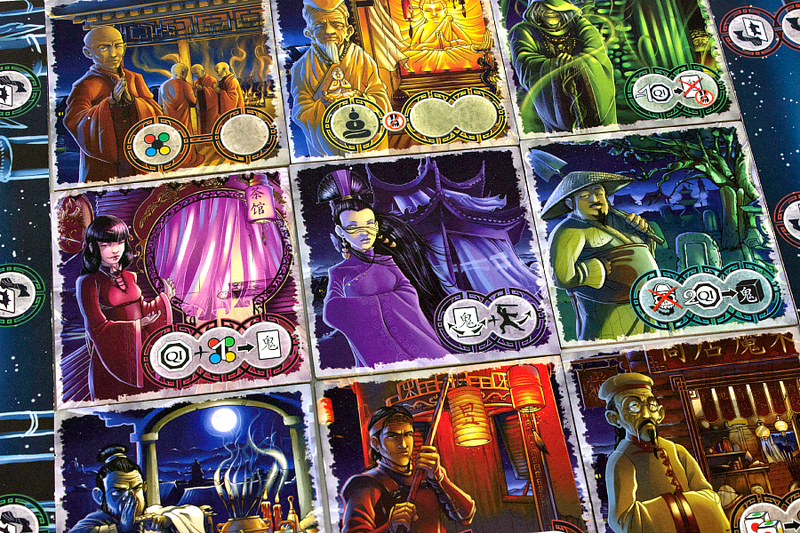 Ghost Stories is an Antoine Bauza-designed cooperative game with his signature difficulty curve. This game drips with menace and danger, and it will take the efforts of all the players to win on even the easiest setting. 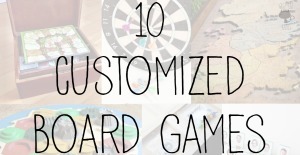 I had a roommate in school who was thoroughly into board games before I really was able to get into the subculture. He was the guy who introduced me to great games like Carcassonne, Settlers of Catan, and Zooloretto. 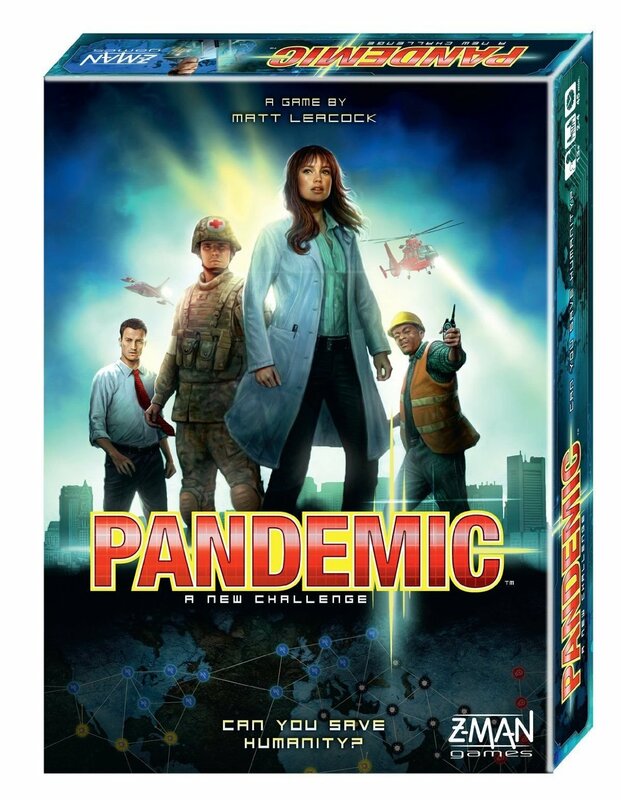 But the defining moment for my board gaming trajectory was a little game that he insisted we try one time: Pandemic. 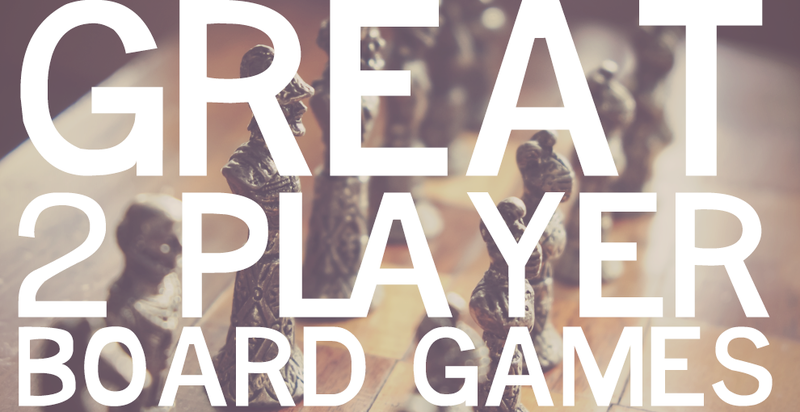 This was the first game where players cooperate to beat the board, which throws all kinds of challenges at you. It ticked a lot of boxes that I had been trying to fill for a long time (as kids, my brother and I worked together to modify other games so we could just play as a team). Ever since Pandemic, I’ve had a major fondness for cooperative games. Then I started hearing about Ghost Stories, a game in which you play as Taoist monks defending a small Chinese village from a demon ghost invasion. It sounded neat, and I eventually managed to acquire it. We’ve played the crap out of it since then! Ghost Stories comes in a standard sized square box. You know the kind by now. It fits pretty easily on our shelf without any need to make adjustments. In Ghost Stories, you receive a decent amount of cardboard: chits and a deck of cards for starters. What’s unique about the game is the town tiles, which are arranged randomly to form the village you’re protecting. Each player also gets a board of their color on which to place the ghosts. 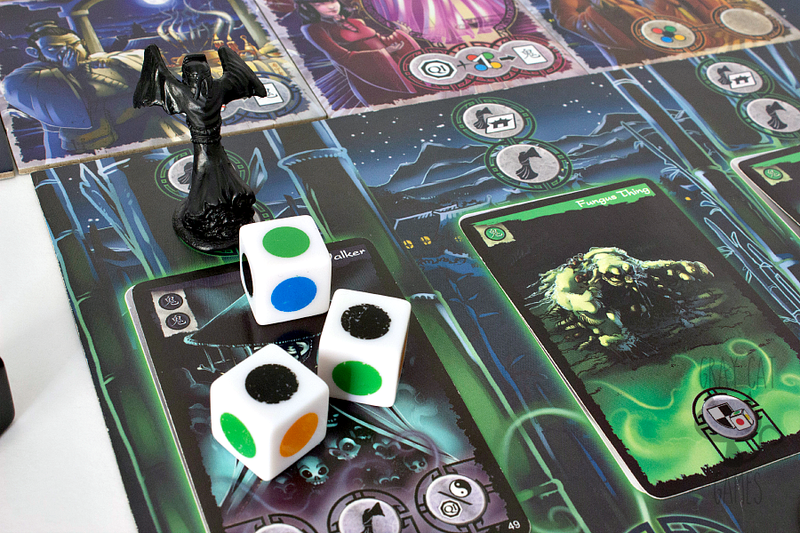 There are also custom dice and quite a few plastic miniatures representing the players and the haunter ghosts. One aspect of Ghost Stories that seems to catch everyone’s attention is the artwork. You don’t run into Chinese supernatural style games, and boy do these cards scream menace. In a lot of ways, it’s the most intimidating artwork I’ve encountered outside of something like Arkham Horror. The cardboard tiles and player boards are very thick and sturdy, which makes them great to handle. You also won’t run into problems with keeping them in place. If I have any qualms with the component quality, it’s with the deck of cards, which is made of pretty flimsy and thin cardboard stock. It’s a good thing this isn’t something like a deckbuilder, where these cards will be shuffled constantly. This is a bit of a minor quibble and something you won’t notice in the middle of the game. Players take turns performing the same action on each turn. First, they resolve any ongoing ghost powers (like forcing you to roll the curse die). Then, they draw a new ghost card and place it in the appropriate spot. This is called the “yin” phase. During the “yang” phase, the player moves one space and then is able to either ask the town member for help or attempt to exorcize a ghost. Each space in the town does something different. Some might restore health. Others can destroy a ghost outright…for a price. 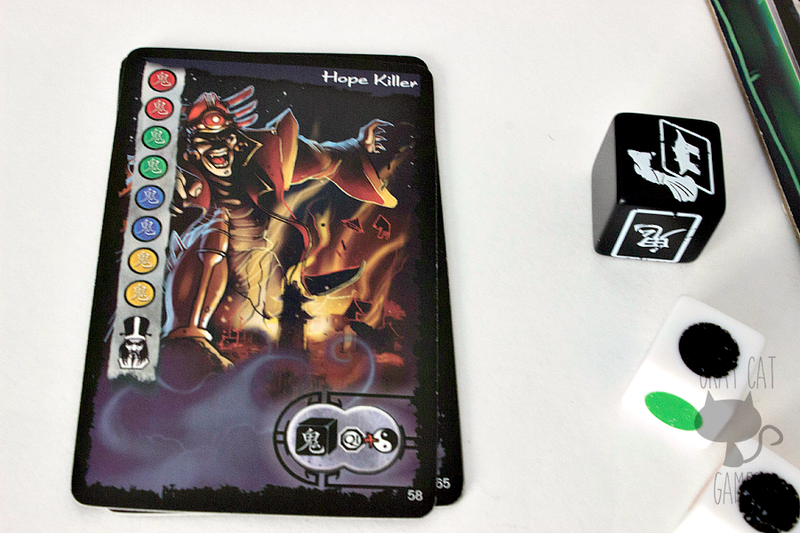 To exorcize a ghost, players roll the dice and attempt to get matches to the colored symbols on the ghost’s card. If he/she can meet or beat that, then the ghost is removed. 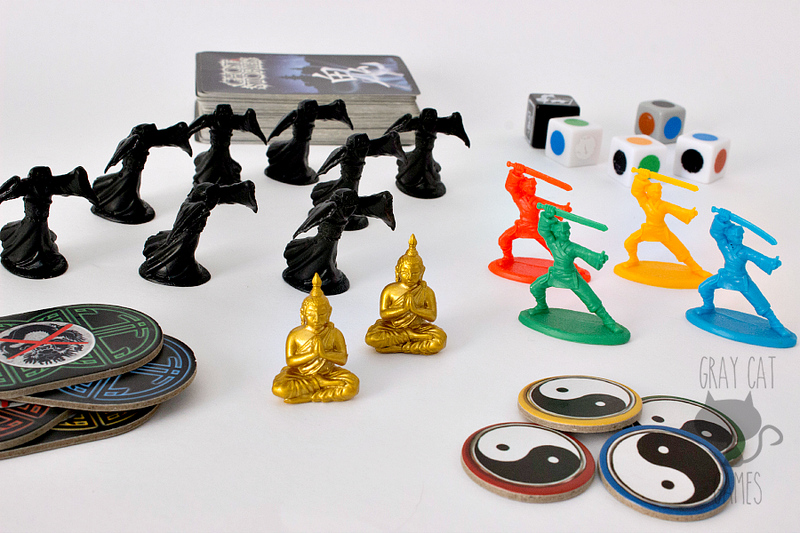 Players can also spend tao tokens of a specific color if they don’t roll enough symbols. It’s an excellent way of mitigating the amount of luck needed to beat these ghosts. Players also have one of two unique powers, depending on the color they choose. 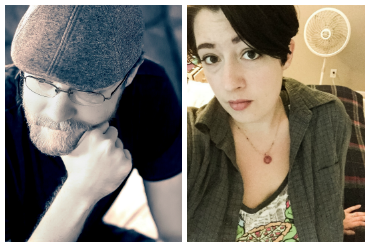 They tend to be variations on a theme. 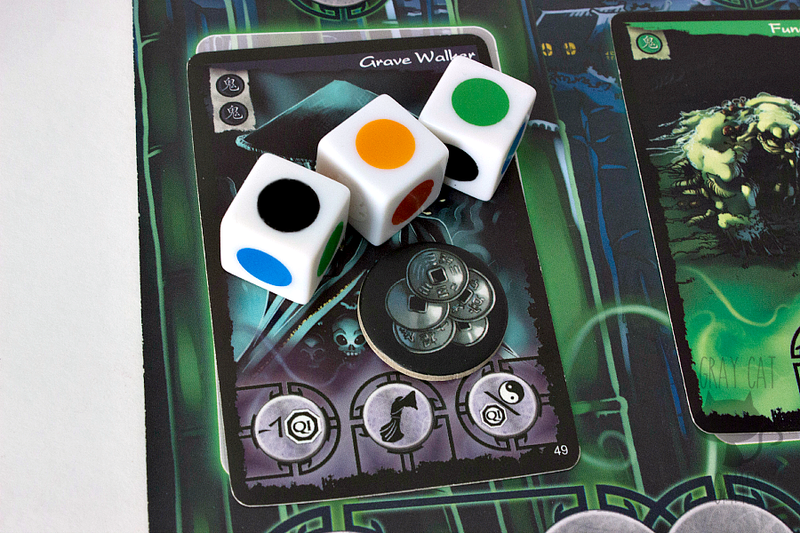 For example, the green player either gets an extra die when exorcizing ghosts or may reroll any dice one time during an exorcism. He/she also gets some control over the curse die, either by ignoring it or getting to reroll it. 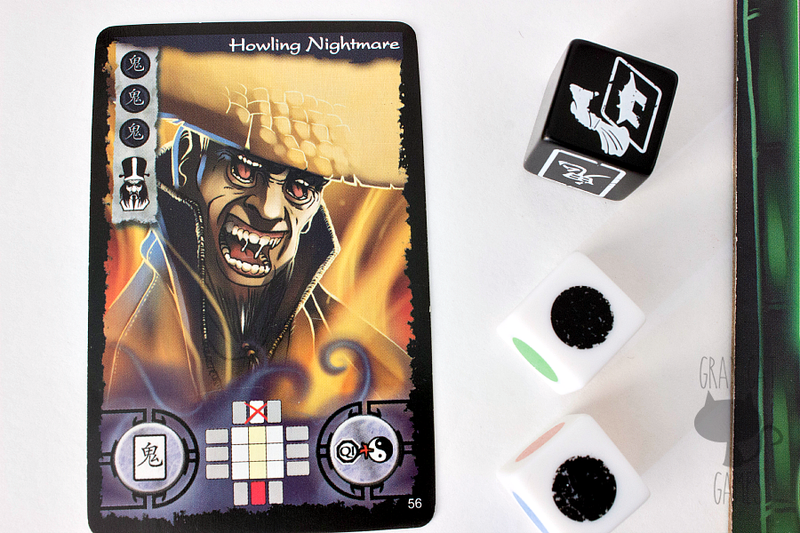 Toward the bottom of the ghost deck is a red-backed card that represents an incarnation of Wu Feng, the big bad guy of this game. Wu Feng is always a unique ghost with different victory conditions. You can bet that by the time he shows up, your resources will be taxed, and he’ll be quite a challenge. In this way, the game can be divided into two general phases. First, your players must survive by dealing with trouble. Second, you must go on the offensive and aggressively take out Wu Feng before the players are overwhelmed. No, in Ghost Stories you don’t have to fiddle with components aside from the initial setup. Other than that, everything is very easy to keep track of in the game once you learn the symbols. Ghost Stories doesn’t play quite like other cooperative games you may have run into like Pandemic and Hanabi. There are similarities, but Ghost Stories amps up the difficulty a lot. 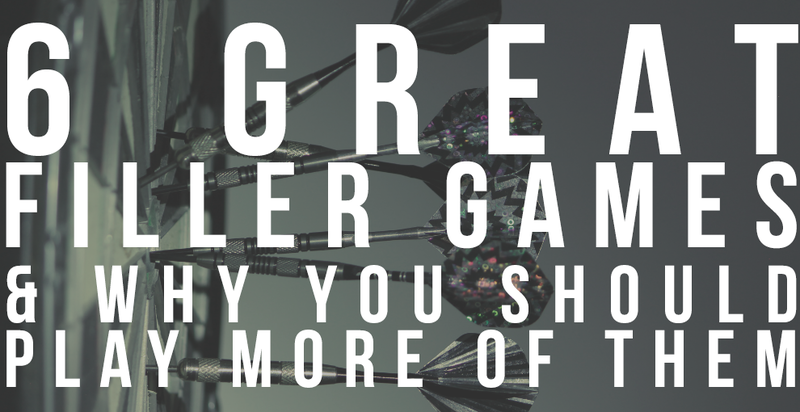 Every decision you make is critical, and this makes the game a lot of fun. It’s a hard one to figure out, really, and I’ve run into a lot of games where it took everybody chipping in their ideas as to what players should do. The player powers, in particular, really add a lot of spice to the game. 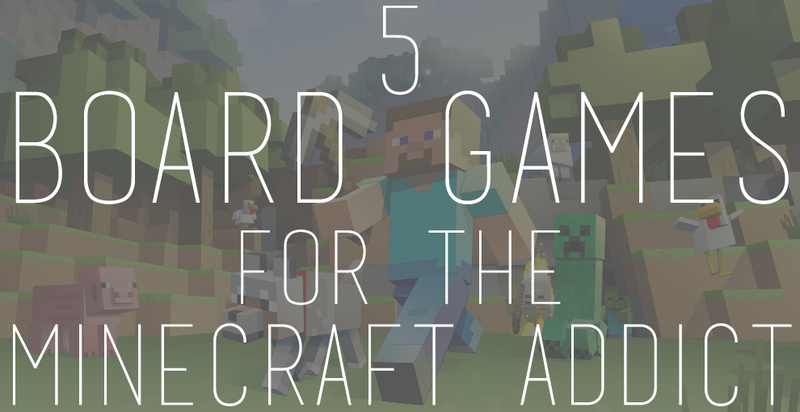 They are completely unique and essential, and they force each player into specific roles, forcing them to discuss and plan to maximize their chances of victory. All in all, I find Ghost Stories to be a whole bucket of fun, from start to finish. You can play this game with anywhere from 1 to 4 players. Four, without a doubt. In fact, I never play Ghost Stories without all four players on the board. There are optional rules for solo play without the extra players, but I hate them. They’re overly cumbersome and add a lot of fiddliness. Even if I want to play solo, I just pretend there are 4 players, all of whom I control. 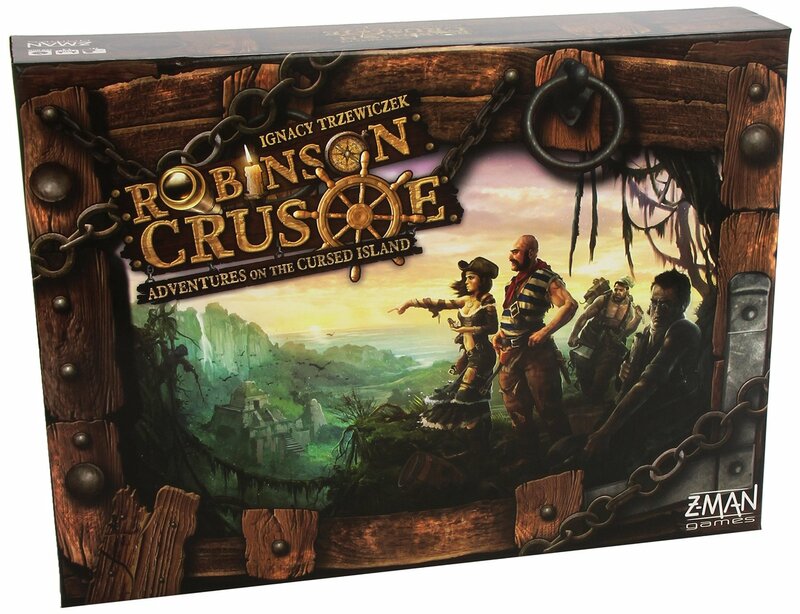 Antoine Bauza clearly designed this game with the assumption that each player’s role will be present, and I think that shows through in the actual playing of the game. Still, it’s easy to play with less than four players. You just have each person control more than one piece. Ghost Stories doesn’t feel like it lasts too long, and there’s a lot of variety in the game. You have 10 different incarnations of Wu Feng, two player powers each, and tons of different ways that the town tiles can be arranged. Every game is unique, which gives Ghost Stories huge replayability. 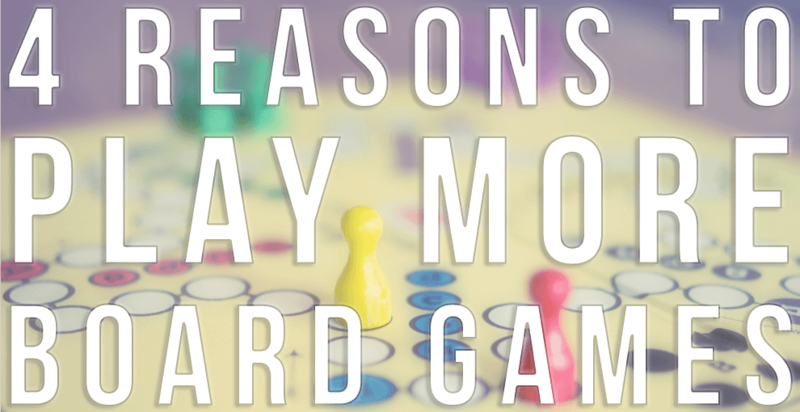 In my experience, I almost always have to play more than once if I want to win. Thankfully, the game is so easy to tear down and set up that it’s easy to jump right back in for another go at the terrible Wu Feng. Ghost Stories has an MSRP of $50, which seems quite high for a game with relatively few components. But these are quite high quality for the most part, and you get a lot of mileage out of this game if you like coops. Amazon also has it for around $32, which is an excellent price for this game. Ghost Stories is HARD. 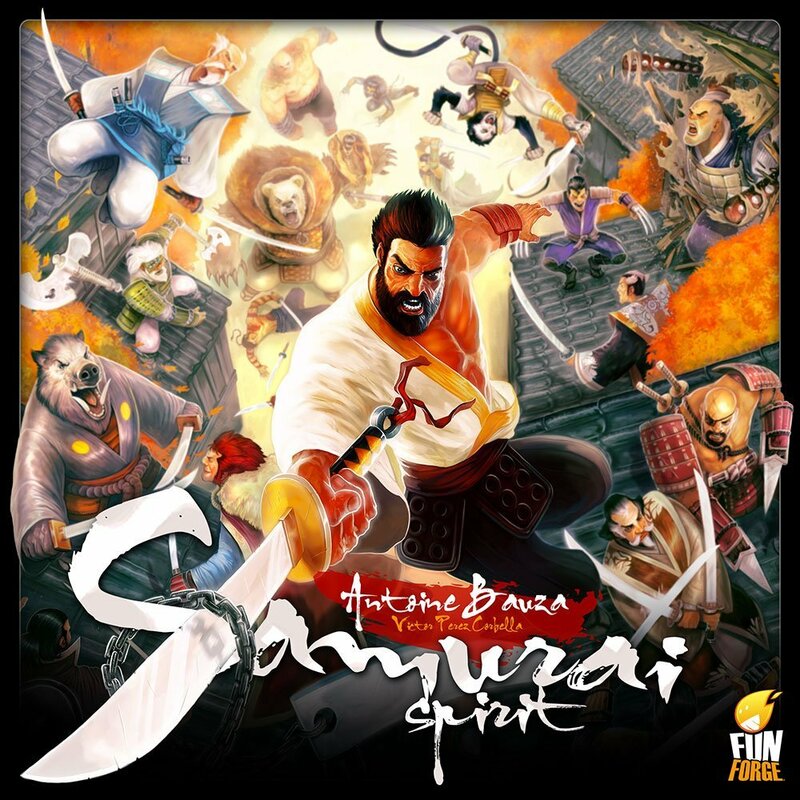 Antoine Bauza likes to include different difficulty settings in the instructions, and we play on easy mode, which provides extra health and a tao token to get players started more quickly. 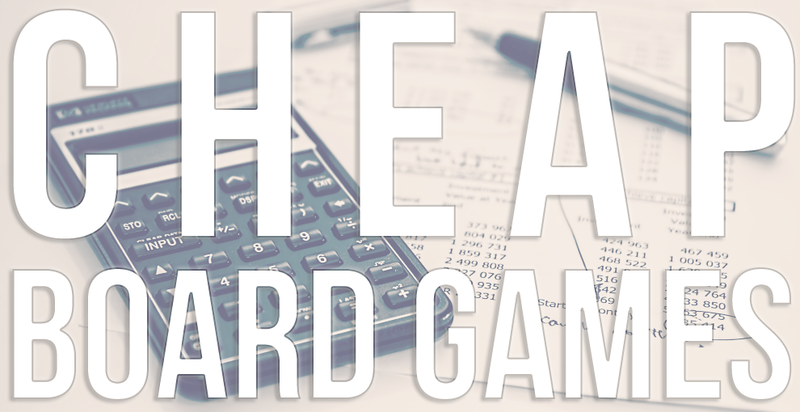 Higher difficulties lower the health of the players and add extra Wu Feng cards, all of which must be defeated in order to win the game. It’s important to approach Ghost Stories from the perspective that you’re not going to win much of the time. My group’s win percentage is probably in the 10-20% range, if I’m being generous. It’s hard. But it’s a fun game to try and beat. And nothing gets us pumped up more than beating it. It’s a worthwhile challenge! The other thing I would encourage people to get past besides the difficulty is the learning curve of the game. The instruction manual has everything you need, but for some reason it’s just not organized in a manner suitable for learning quickly. I honestly don’t know why, but I’m not alone with this complaint. One issue you’ll run into the sheer number of symbols, which are used to convey everything. The symbols are easy enough to look up, but they’ll probably stop your first few sessions quite a number of times. 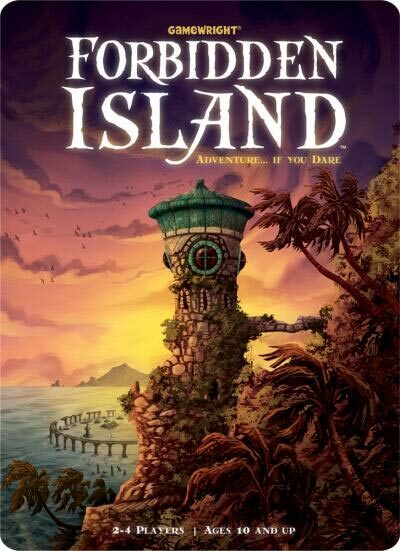 If you pick this game up, I definitely recommend skipping the rule book and finding an online tutorial on how to play the game. It’s very very much worth getting past the learning curve to get to play this meaty and fun game. If you like Ghost Stories, you might also enjoy….